The arrival of European explorers and Christian missionaries in the 18th and 19th centuries has led inevitably to Niue’s integration into the global culture. It has obviously had its benefits in terms of education, medical care, travel and employment opportunities. But it hasn’t been without its downsides – among them the loss of culture, and a colonial era during which Niue was subject to the whims of at times arbitrary and patronising colonial rulers. Among the darkest episodes in Niue’s history were the loss of many men in the mid-1800s to the Pacific ‘black birders’ who would capture them, imprison them aboard visiting ships and sell them to work as slaves to work in Peruvian mines. In World Wars 1 and 2, when England was keen to protect its Empire, its colonies were searched for potential soldiers and Niue provided hundreds of men, many of whom did not return from northern hemisphere battlefields. In this photo, Privates Filitoua (22 yrs) and Taleva (25 yrs) of the New Zealand Maori Battalion lie at rest in Commonwealth Graves in Hornchurch, England. About 100 soldiers from Niue went to Hornchurch to convalesce after falling victim to common European diseases, acquired while digging trenches under shellfire in Northern France in the bitter cold of the spring of 1916. 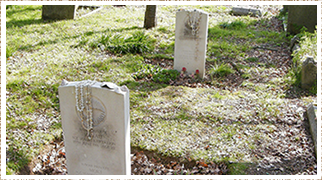 The kahoa hihis (shell necklaces) on the gravestones were placed there by Niue-born IT consultant Shirley Sisepi-Fraser who visits the graveyard whenever she is in London on business. In a speech on Anzac Day 2012, NZ High Commissioner Mark Blumsky told the story of Niue’s contingent to World War 1. It’s a story of some of Niue’s bravest sons and of the 17 who did not return home.